British newspapers are often seriously challenged when representing the everyday truths about black people’s lives in text and images but as little time ago as 1985, it was rare to see a black person’s face in print at all. It is clear that most news stories about a whole range of people and situations, are reported in almost any way that will sell newspapers, the result is that no one’s story is told without recourse to at least mild exaggeration, distorted images and insider humour, whenever possible. 2007 was the year that the country “commemorated” the 200th anniversary of the Act of Parliament abolishing the slave trade in Britain. We thought that the images of black people in the Guardian newspaper,which is read by people who work predominately in the health service, social services, education and the media, would be particularly important. It was with this is mind that the project began. 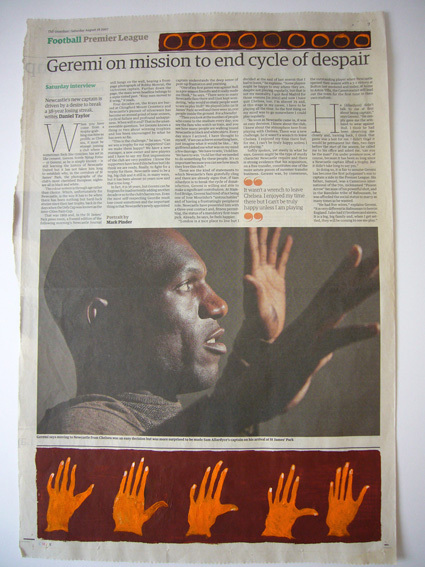 Every edition of the paper that year was examined for images and texts in which a black person played a central role. We found that the paper, no doubt in the interests of good design and witty narrative, used black people in a very subtle way which could be said to undermine their identity. The newspaper did this on several hundred occasions. To date, (Summer 2009) in order to highlight the findings, and to reclaim the image of each black person depicted, Lubaina Himid, using predominately African patterns, has so far, over painted around fifty of these pages. During 2008 and 2009 the project has continued to develop but now the aim is to target particular politicians and sports people in order to monitor changes and developments in the way they are represented over a period of time, rather than employ the broad gathering methods used in 2007. The Guardian Paperworks are an ongoing series of paperworks which were first shown as part of Swallow Hard : Lancaster Dinner Service at the Judges Lodgings in Lancaster in 2007. 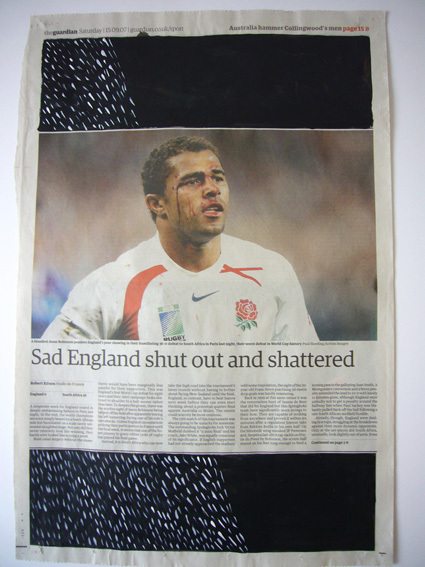 The paperworks in this exhibition are a series of pages from the Guardian taken from editions purchased in the past year. When the text is unusually pessimistic or the image alludes to the African as slave, it qualifies. There are a lot of footballers and some rugby players but because it’s rare to see the Black adverstising executives, physicists or engineers in the paper they don’t really feature in the series. Often Black people are used to fill a gap or add colour. Sometimes the picture editor seems to have a fixation on a particular person and use them week after week to illustrate a point or lift a narrative. The invented and borrowed patterns on each page are painted to highlight this strange and inappropriate use of people as signifiers and to finally vent my spleen. Every day in Britain even the “liberal” press is simultaneously visualising and making invisible black peoples lives.